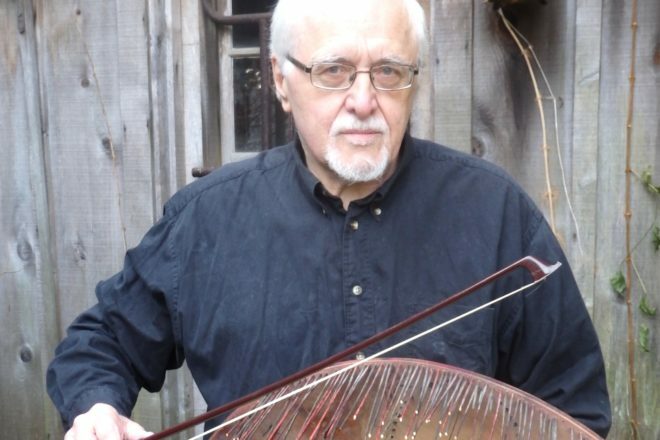 Instrument builder and musician Hal Rammel will perform the amplified palette, his own invention, at the March 24 BEGIN concert. Submitted. Hal Rammel, dressed in head-to-toe black, faces the audience from behind a table. 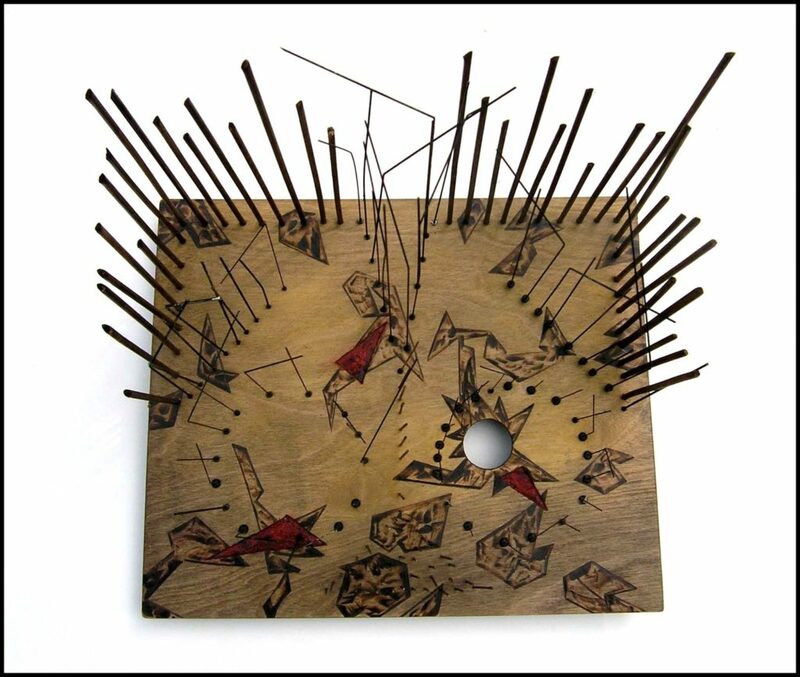 In his right hand, two wire mallets dangle at 45-degree angles, forming an upside down V. On the table, hundreds of wooden and metal rods jut out from three wooden artist palettes. With the flick of a wrist, he sweeps the wire mallets lightly over the palettes and the chime of church bells rings out. He pulls his hand back, the echo of the tone giving way to an 18-minute performance at Milwaukee’s The Borg Ward in which Rammel draws from these mysterious instruments a layered array of foreboding, chaotic and rattling bell tones. His command of the performance is as enthralling as the sounds he elicits. A magician-esque conductor, Rammel scarcely looks up during the production, instead directing an intent focus on the palettes as he swaps in different mallets, at one point using six simultaneously. It is a performance never to be repeated – Rammel is, after all, an improvisational musician – but the multi-palette and multi-mallet arrangement is one he will use during his March 24 performance for Sturgeon Bay’s BEGIN concert series. The Cedarburg musician is an ideal fit for the experimental concert series, which launched in December, not only for his performance technique but for the “sense of discovery” that has inspired him to invent the instruments in those performances. 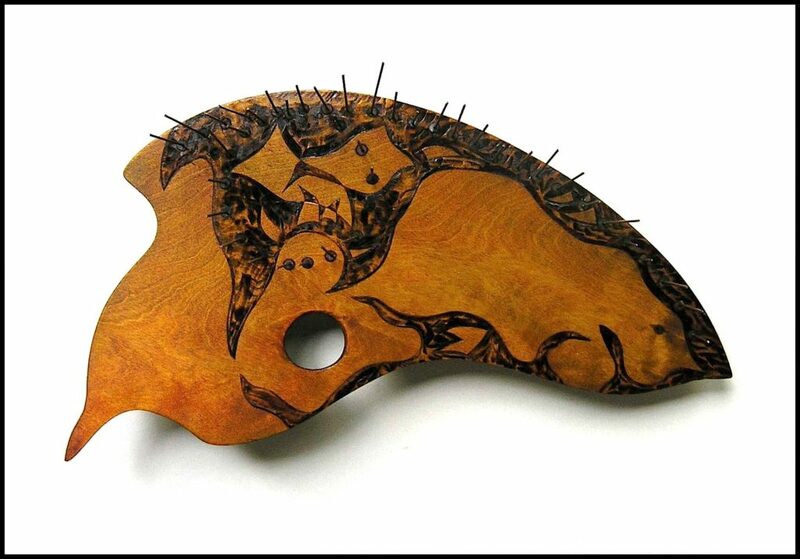 It has been nearly 30 years since he invented the amplified palette, a musical instrument made by mounting wooden and metal rods of various lengths and diameters vertically onto artist palettes. They are amplified using a contact microphone and hand-decorated by Rammel. Rammel is not a formally trained musician, instead considering himself a natural product of listening, observing and doing. An early interest in jazz and classical music, combined with his discovery of instrument builders like American composer Harry Partch and jazz musician Nadi Qamar, put him on a lifelong path of audio discovery. He has built a host of percussion and string instruments, and taught the craft at the School of the Art Institute of Chicago. He considers his instruments to be largely improvised, “but it’s improvised over the course of 25 years.” The same can be said for his style of playing, which explains why Rammel builds for self and not to sell. While Rammel is not resting on his laurels, his works have already gained him national acclaim. In 2013, 14 of his instruments were added to the permanent collection of the National Music Museum in Vermillion, South Dakota, an occasion for which Rammel spoke and performed. Four of those instruments are related to ones he will perform with this weekend in Sturgeon Bay. His show will explore different aspects of the amplified palette through three pieces, which are partially composed and partially left to improvisation. Rammel aspires to provide listeners with a strong idea of the possibilities that exist when you approach a performance without preconceptions or conventional expectations. “Performances on these pieces don’t follow a lot of what we think of in terms of rhythms and song forms and tunes and melodic repetitions that are part of conventional music but I would hope the opportunity to witness the music being produced out of these has some level of drawing people in,” he said. Rammel will perform at 7pm on Saturday, March 24 at the event space above Artists Guild in Sturgeon Bay (far right door). The series is limited to 40 seats per event and no advance tickets will be available. A suggested donation of $10 at the door will go directly to the performing artist. For future BEGIN performances, visit rhythmplex.com/event-directory. More information on Rammel can be found at halrammel.com or by searching his name on YouTube.